Many products and techniques are available for patients who want to achieve a whiter smile. With so many options available, it can be difficult to choose the method that is right for you. The best way to begin any teeth-whitening regimen is to schedule an appointment, and talk to your doctor about the differences between in-office professional whitening and at-home whitening. During this visit, your dental professional will apply the high concentration whitening gel over your teeth while protecting your gums. The entire session generally takes about 90 minutes and will give you a great jump start to your whitening. There are many over-the-counter teeth whitening options. One type of readily accessible whitening product is commonly referred to as “paint-on” teeth whiteners. Paint-on whiteners can be purchased over the counter, and are generally less expensive and less effective than whitening strips or professional options. 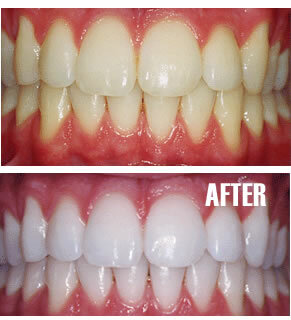 Paint-on teeth whiteners consist of a gel applied to the tooth using a small brush. The gel hardens into a film that coats the treated tooth, and dissolves in the mouth. As with any teeth-whitening regimen, it is wise to consult with a dental professional before treating discolored teeth. Teeth-whitening strips are thin, flexible plastic (polyethylene) strips with a film of hydrogen peroxide bleaching on one side. Whitening strip kits come with two types of strips: strips for the upper teeth and strips for the lower teeth. The bleaching agent is applied by placing the strips across your teeth and gently pressing them into place to ensure contact with all your teeth. Teeth-whitening strips are typically worn for 30 minutes a day, twice a day. The duration of treatment will vary. The least expensive options are whitening toothpastes and mouthwashes. Designed to have “whitening” capabilities, toothpastes and mouthwashes work to remove surface stains using mild abrasives. However, unlike bleaching materials used in professional whitening procedures, these products do not lighten the actual color or shade of the tooth.